The supermoon lunar eclipse will be visible in the Americas, Europe, Africa, western Asia and the eastern Pacific Ocean on the night of Sunday, Sept. 27, in just a week. With the huge supermoon lunar eclipse just one week away, it's time to dust off your small telescopes and binoculars, track down an observatory event or webcast, or draft your invitations for a moon-cake party. Don't wait too long — if you miss it, the next one isn't until 2033. During lunar perigee, the moon appears larger and brighter in the sky, which is why a full moon coinciding with perigee is known as a "supermoon." (A "minimoon" is when the full moon is at its farthest point from the Earth.) This large moon will present the perfect canvas to watch the Earth's shadow slide over and block the moon's light. As if that weren't spectacular enough, there's the origin of the eclipse's other name, "blood moon." The moon doesn't simply disappear into Earth's shadow during a lunar eclipse; instead, it's illuminated by an eerie, reddish glow of the light refracting through the edges of Earth's atmosphere. The moon will be shrouded in shadow Sunday night or early Monday morning (depending on the time zone). It will enter the dark part of the Earth's shadow at 9:07 p.m. EDT Sunday (0107 GMT), and it will enter a total eclipse by 10:11 p.m. EDT (0211 GMT Monday) before beginning to emerge from shadow 72 minutes later. Areas that cannot see the full eclipse, because sunset comes too late or sunrise too early, may still be able to see part of the moon obscured. Several webcasts are planned to stream live views of the eclipse online. 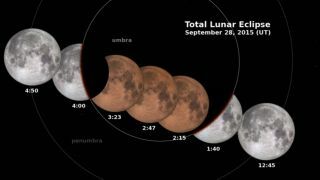 The Slooh Community Observatory, a skywatching website that provides users access to remotely operated telescopes, will offer a flagship webcast of the lunar eclipse that can be accessed at the Slooh website, where visitors can also find Slooh's archive of past webcasts. In Los Angeles, California, the famed Griffith Observatory, will host a live webcast of its public viewing event, where the observatory will provide binoculars and telescopes for people to watch the eclipse. Astronomy buffs can listen to the LA Philharmonic and Steinway & Sons play moon-themed music as the eclipse takes place, and webcast viewers can follow along as well. And the University of Arizona's SkyCenter observatory atop Mount Lemmon will also stream live telescope views in an updating image at its SkyCenter website here. Of course, in addition to the telescope, binoculars and webcast viewing methods, the eclipse can be seen with the old-fashioned naked eye — so be sure to look up! Editor's note 1: If you capture an amazing view of the supermoon lunar eclipse or any other night sky view that you would like to share with Space.com for a possible story or gallery, send images and comments to managing editor Tariq Malik at spacephotos@space.com. Editor's note 2: An earlier version of this story erroneously stated that the total eclipse will last 12 minutes. It will actually last 72 minutes.